What is sous vide cooking, and how does it work? This form of cooking involves the placement of foods into heat-proof plastic bags, the removal of air from inside the bag, and cooking of the food in a circulating hot water bath. Essentially, sous vide is a practical, efficient method to serve better-tasting food to your family or guests. But finding the best sous vide equipment is no easy task. We are here to break it down for you into digestible pieces. However, buying up ten machines is unfeasible. How would you go about finding the perfect machine for your needs? Read on to find out! Our top choice for the best sous vide cooker is the ChefSteps Joule Sous Vide, followed closely by the Anova Culinary Sous Vide Precision Cooker and Sous Vide Supreme Water Oven. However, there are ten solid options that we have sous vide reviews for, all of which get the job done with minimal mess and error. All our listed options fall into the main two categories for sous vide machines: immersion circulators and water ovens. While they vary drastically in how they appear and are used, both provide the same result with the same method: heating and circulating water to cook food to precise temperatures, without overcooking or undercooking. Power of the best sous vide immersion circulators are measured in watts. The higher the watts a model has, the faster it can bring the water bath up to the specified temperature to cook your food. This does not come without its downsides, though. 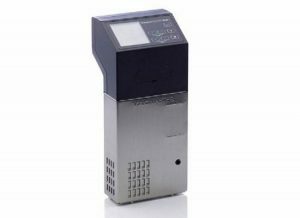 The more power sous vide units have; the more users need to be cautious about evaporation. When cooking larger meats and foods (anything for more than two hours), evaporation will likely become a concern. If so, it’s important to keep an eye on the water level to ensure it doesn’t drop below the minimum level. Water levels below the minimum when working with the delicacy of water bath cooking can spell disaster for the final product. All our sous vide cooking equipment reviews feature sous vide devices with wattages between 800 and 1,500. Keep in mind, a wattage of 800 is close to that of a smaller microwave. A wattage of 1,500 is incredibly powerful, and has even more power utilization that full-size microwave ovens. Immersion circulators that heat and circulate water at the same time, which can be inconvenient at times, because they don’t include the necessary vessel and can be finicky to set up with the proper amount of water. Water baths that provide both a heat source and the bath vessel, which are more convenient but less accurate, and take up far more space in your kitchen, inconvenient if you are already pressed for countertop or cabinet real estate. For most at-home cooks wanting to get started with sous vide, immersion circulators get the job done just fine. These products will typically clip onto the side of a vessel, whether a plastic storage tub, pot or cooler. They heat the water to the cook’s desired temperature, and utilize an impeller for circulation of this heated water throughout the container the immersion circulator is placed in. As the circulators are actively forcing the water around the vessel, the water temperature is more even across the breadth and depth of the vessel. This provides a more evenly cooked final food product. Additionally, immersion circulators are smaller and less bulky than full water baths, and can be stored away easily, keeping yet another small appliance from taking up valuable countertop or cabinet space, as mentioned above. However, self-contained water ovens should not be discounted. These are typically a better option for those looking for a simpler sous vide solution. There is no need to dig around for a vessel, no worries about a circulator coming unclipped, and no problems with the proper circulation of water. These were developed for pure ease of use and consistency, and are great in many situations. But regardless of if immersion circulators or water ovens are your game plan, what should be the first things to look out for when researching a sous vide cooker to buy? When on the hunt for the perfect sous vide cooker, there are five main things to keep an eye on: convenience, stability, speed, accuracy, and price. The strongest power players in the personal sous vide market for convenience factor are those not requiring dedicated counter space, and those that work well with any size vessel. As most of the immersion circulator market either runs via smartphone app over WiFi or Bluetooth wireless signal, or is minimalist and Spartan in the traditional sense, this feature follows a whatever-floats-your-boat style. Some appreciate the hand-holding style and interface of having everything on your phone. Others prefer sous vide cookers that have the controls on-board, not requiring a second electronic device or relying on wireless networks to remain strong. Cooking sous vide requires water to remain at specific temperature ranges for extended time periods. Both immersion circulators and water baths tend to handle this task with ease. Depending on the power output of your device, opening the vessel to check on your food could prove detrimental. This lowers the water temperature, and it can sometimes take several minutes for the sous vide machine to increase the temperature back to the requested levels. This should be a given. Time is money. Sous vide users are not wanting to spend hours waiting for the cooker to bring a vessel of water to the proper temperature to begin the cooking process. Some immersion circulators and water baths fall short in the power department. This can lead to a large container of water failing to maintain proper temperature levels. Eventually this will also lead to an undercooked final product that takes far longer to reach that point. Power is a must, and the more powerful a heating element on a sous vide machine, the faster the proper temperature can be reached. With some food types (mainly eggs and other delicate meats) temperature variances of a single degree while cooking can result in a completely different outcome. For this reason, it is vital to purchase a sous vide cooker that has the accuracy to adjust temperatures to miniscule levels. This ensures that, regardless of the food being cooked by the machine, you’ll have the same outcome time and time again, eliminating food waste and ensuring a positive result with no spots of obvious hot or cold. Like it or not, price matters. 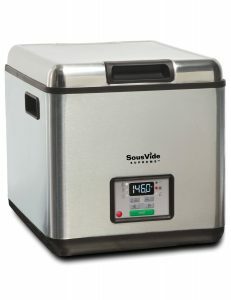 The price of a sous vide cooker is a major driving factor in the resulting quality of product, and in turn how well it cooks food based on the above criteria. However, it is important to note that price is not a sliding scale for effectiveness. There are immersion cookers that are in the $100 to $200 price range, providing just as good a final product competing products for $500 or more. Convenience, stability, speed, accuracy and price are all incredibly important factors that should play into any sous vide purchase. However, there are additional considerations that need to be considered, based on your own specific needs. Some of these include: timing, power interruptions, proper calibration, heating power and more. Not all sous vide immersion circulators and water baths have built-in timing features. For our purposes, though, this is a highly useful option. Most have one of two options available: count-down and count-up. Count-down timers are the standard for most cooking processes, not just with sous vide (think microwaves, ovens and more). A user set a timer for a specific length, and that timer counts down from the length to zero, at which point an alarm goes off, whether on the device itself or via a notification to your smart phone via a connected app. Count-up timers are not as common, but are available with some of the sous vide cookers on the market. These are perfect for when you are cooking things for very long time periods, such as 36-hour ribs or pork roast. They simply start at zero and count upwards, which is ideal when food needs to be checked at certain intervals. These are both wonderful for tracking the cooking process. However, timers that shut down on their own after a specific time are far less effective. These timers are notorious for allowing food to drop down in internal temperature to a point where the probability of harmful bacterial growth becomes a real danger. It wouldn’t be overthinking things to be concerned about potential issues with power interruptions when cooking sous vide. 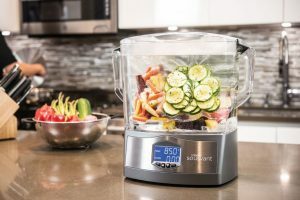 Typically, if the power in your home, or at least in the outlet your machine is connected to, blinks or goes out, once the power returns the sous vide cooker will start back up and push itself to the selected temperature. However, the time in which your food stays at a lower temperature can breed some serious and harmful bacterial growth. Some sous vide machines change display colors or send an alert notification to let you know if this has occurred. Calibration is incredibly useful. This process uses a high-quality food-grade thermometer to determine if the heat level displayed on the sous vide machine is the actual heat level of the water. If you find it a few degrees off in either direction, this can spell out disaster for your final product. A five-degree difference in actual to displayed temperature is an entire phase of a steak. Calibration is a strong step for more experimental and precise home chefs. However, we cannot stress enough that if your thermometer is not extremely accurate, being able to calibrate your sous vide cooker can cause more harm than good. Powerful heating elements warm water faster, period. They also can re-introduce heat to the water after adding cold food far faster. Keep in mind, though, that having a far more powerful heater in the long run might not be the end-all be-all for your sous vide cooking needs. Sometimes, an extremely powerful cooker such as the ChefSteps Joule sous vide review below, can cause a breaker in your kitchen to flip from the consumed power. There is a delicate balance at play between power and utility. While having an incredibly powerful sous vide machine can be a great thing when cooking larger food objects, or when cooking for extended time periods, there are workarounds. One of the most common workarounds is to simply take a lower wattage immersion circulator and introduce hot water to the bath itself to inflate the temperature manually. 750 watts is about the power level of one of those very small microwaves that are commonly used in dorm rooms. 1,100 watts is about the power level of a full-size microwave often found above ovens and stoves. While the difference in heating power might make all the difference if you are cooking larger foods like multiple racks of ribs or a pork shoulder, it should be noted that the higher the power level, the higher the likelihood that a breaker gets flipped and you are in hot water (that is rapidly cooling). Don’t buy a race car for highway driving, but don’t take a sedan to the track. The above factors and testing criteria are relatively all-encompassing, but there are many other things taken into consideration when developing our Sous Vide Buying Guide for 2019. How large is the sous vide cooking machine? Some immersion circulators are downright tiny. Other water baths take up the space of a portable rotisserie oven. What size container can this machine properly heat water to an accurate temperature in? It was surprising the size container some of these machines could properly heat. If an immersion circulator, how does it connect to the vessel? Is there a magnet involved? Some of the immersion circulator reviews have magnets connecting the machine to the base of the vessel. Is there a miniscule discrepancy between the minimum and maximum water levels? If so, there is the possibility you will need to refill water multiple times in the process due to evaporation. How loud is the sous vide machine? It was surprising how quiet some of the machines tested were, only emitting a low hum and bubbling. How do the machines test with sous vide bag types? Do these machines perform any differently when using vacuum sealer bags compared to standard zip-lock bags? How well do the sous vide machines work with recipes found in standard sous vide cookbooks? It’s apparent that the machines will work with the recipes in their own example booklets. But what about when they branch out to recipes found in common sous vide cookbooks? These and more can make the difference between a stellar sous vide machine and one that falls flat when put to the test. Read on to see what our findings were, and what we determined the top 10 sous vide machines were for 2019. Our reviews come from thorough knowledge of the best sous vide products on the market, combined with years of experience in the food industry and aggregation of thousands of sous vide reviews spanning across many different relevant sites. Through this, we have cultivated a top ten list and comprehensive buying guide to meet any potential consumer’s needs. Without any further ado, let’s dig in! The ChefSteps Joule Sous Vide is the top product on our list for a variety of reasons. It is a well-designed, minimalist, compact immersion circulator that outperforms competitors in almost all categories mentioned above. This sleek product puts out 1,100 watts of power, ensuring an even, quick cooking time for any food put to the task. It is small, at only 11 inches in height, 1.3lbs in weight, and a two-inch diameter immersion tube. Comprised mostly of white polycarbonate, the machine has two stainless steel rings at the top and bottom. At first glance, one thing that should be immediately apparent about the Joule compared to alternatives is its complete lack of onboard controls. All control of the machine is performed via a mobile app through WiFi and Bluetooth, much like the Mellow reviewed back in December. The Joule has a blue light to let you know that it is on and responsive, but that is all. This is advantageous, as it makes the unit solid as a rock and water resistant (no buttons). However, it can be a disadvantage as well, as if you have connectivity issues, it can affect the outcome of your food. The Joule has a mounting clip, magnet for metal base connectivity, and an incredibly wide range of water minimum and maximum temperatures (1.25 to 8 inches). However, it should be noted that there are no markings on the product itself to indicate this. The Anova Culinary Sous Vide Precision Cooker is highly rated, much like the Joule above. It has more of a traditional look and feel, more in line with most stick-style immersion circulators on the market. Much like the Joule, most tasks with the Anova model occur via the Anova app, which is minimal and contains a full suite of features to ensure that your food is cooked perfectly every time. This product puts out 900 watts of power, still plenty to ensure fast cooking times and properly cooked food. It is slightly larger than the Joule, measuring close to 15 inches high and almost three inches in diameter at its widest point. There’s also a new Anova Nano Precision Cooker, which has 750 Watts! Like most top-rated sous vide machines, the Anova’s process has been made simple and intuitive. Just attach the Anova to a water-filled pot. Then, set the time and temperature, which can be done on the device or through the Anova Culinary App. Place your food of choice in a Ziploc bag, drop it in the water, and clip the food to the side of the pot and let the immersion circulation work its magic. Currently, the real draw to the Anova option versus the Joule above boils down to two main things: the ability to adjust and control from the machine itself, and its integration with Amazon’s Alexa. Voice control turns the Anova Culinary Sous Vide Precision Cooker into your sous chef with minimal setup necessary. Unlike the Anova and ChefSteps options above, the Sous Vide Supreme Water Oven is an entire appliance, ready to go without needing to find a properly-sized pot or configure a cooler to work for your immersion circulation needs. The Sous Vide Supreme option touts itself as the first water oven developed to make sous vide cooking affordable and straightforward. It is the most reasonably-priced water oven machines on the market, and the glowing sous vide water oven reviews back up its quality. This product is the closest item on our buying guide to a slow cooker. It has simple controls, and no need to download an application and connect to the device via Bluetooth. This is old school sous vide. Additionally, the Sous Vide Supreme Water Oven is known for its natural clean-up process. Unlike stick-style immersion circulators, which require the use of a pan, and cleaning can get messy, this device needs you to empty and wipe down the interior. While it is a full water oven, the Sous Vide Supreme option is energy efficient and extremely quiet, using the energy equivalent of a 60-watt lightbulb once the cooking process hits its target temperature. Temperature adjustments are accurate to a single degree, allowing for maximum customization of the cooking process. The Tribest Sousvant SV-101 is a water oven like the Sous Vide Supreme above, but with a transparent and removable vessel, allowing for more straightforward filling of water and visibility of the cooking process. This is important, as being able to see your food cooking will alleviate the need to continually be checking by opening a lid, causing the temperature to drop rapidly as it adjusts to the cooler air introduced by your curiosity. This product boasts of its all-in-one capabilities, with simple clean-up and without the need for finding another container, clipping on immersion circulators, or dealing with smartphone apps and faulty WiFi connections. Everything needed to get started with sous vide is present in the Tribest Sousvant model, with foolproof controls and a large display. The temperature controls are precise, providing the perfect food results time after time. The Tribest model has an impressive 1000-watt circulation power system, heating water rapidly and adjusting to an astonishing 0.1-degree accuracy. 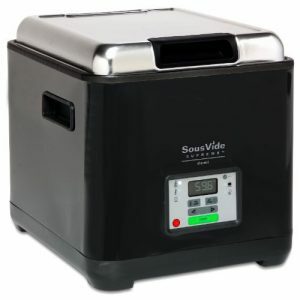 Even with the powerful power output, the machine is still whisper quiet, a feature backed up by many sous vide reviews. 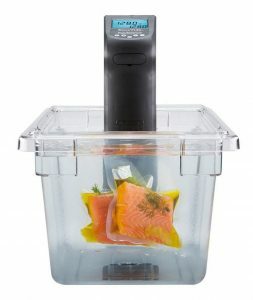 The Kitchen Gizmo Sous Vide Immersion Circulator is one of the most affordable entry points for sous vide on the market. Unlike the above immersion circulators by ChefSteps and Anova, the Kitchen Gizmo option does not require application installation or connectivity. Instead, this is a more traditional approach, with all controls on the device itself. This product features an easy-scroll selection wheel to allow for precision cooking of food and a touchscreen control panel. The motor is powerful, running at a maximum of 800 watts, providing rapid heating of the circulating water in whatever vessel it is clipped to. Made for the beginner sous vide cook, but applicable to all skill levels, the Kitchen Gizmo Sous Vide Immersion Circulator comes with a temperature guide and a hefty cooking guide filled with fantastic recipe options. This provides users dozens of choices for not only incredible meal options but also varying cooking styles and sous vide processes. PolyScience Culinary has been touted as one of the leaders in sous vide worldwide. This is the immersion circulator used by professionals in world-class kitchens around the globe. While it is one of the most expensive immersion circulators on the market today, it is also the strongest around, with multiple impressive features that blow other immersion circulators out of the (hot) water. This product was designed for purely commercial use, which leads to a lack of design aesthetics. But for the lack of curb appeal, the PolyScience CHEF Series makes up in functionality and practicality. This thing is a tank. It features an 1100-watt heating mechanism, and maintains water temperature to the 0.1-degree level, combining the impressive power level of the ChefSteps Joule with the precision of the Tribest option above. This powerful heating level and industrial aim allow the PolyScience model to work flawlessly in water baths up to 30 liters, pumping through 12 liters per minute in circulation. 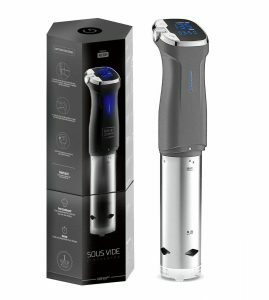 This is astronomical compared to all other sous vide machines in this buying guide. This device is one of the best sous vide cookers that has ever existed. Its only downside is the price point, which will likely scare away entry-level and home chefs looking to buy a sous vide machine. The Sous Vide Supreme Demi Water Oven provides similar features with a build much like the standard Sous Vide Supreme reviewed above. Think of this as its little brother, coming in at a smaller footprint and a lower price point. This product was introduced as a more affordable, more space-conservative option to its alternative. Regardless of its diminutive size (the product has an 8.7-liter maximum tank size), it still packs quite the punch and is surprisingly roomy. The tank holds a dozen four-ounce food portions without breaking a sweat, and the single-degree precision ensures that any food type can be cooked to perfection with limited opportunity for errors in the process. The Demi is more energy efficient and quieter than alternative water ovens, and much like its big brother, it uses the energy equivalent of a 60-watt lightbulb once the cooking process hits its target temperature. 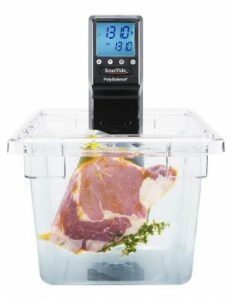 The VacMaster SV1 Sous Vide Immersion Circulator is a beautiful choice for commercial use or frequent home utilization. It has a very durable design, precise timer mechanism, and a powerful heating process. There is no need for phone connectivity with the VacMaster option. Everything can be controlled from the circulator itself. One big draw to this circulator is its small footprint, only 2.75 inches deep. This provides far more space for your food to cook and for the water to circulate. Its digital control panel is intuitive and simple for beginners to use. The product has a professional-grade pump, designed for commercial use, and like the PolyScience CHEF, can handle 30-liter water baths with ease. This is due to its 1500-watt heater, which is far more powerful than the other immersion circulators being reviewed. However, this causes the price point to be a bit higher than comparable alternatives for home use. The CREATIVE model from PolyScience is the company’s response to the higher-priced commercial success of its CHEF model and widespread restaurant use of its even more expensive CLASSIC model. Home sous vide cookers were wanting an option that was more affordable, while still retaining most of the qualities loved in its predecessor. As with the CHEF reviewed above, the PolyScience CREATIVE Series Sous Vide Immersion Circulator was designed for durability and consistency in mind, not aesthetics, so it is bulky and not very attractive to look at. However, powerful features such as a longer power cord, stronger clamp-style clip, and consistent display make up for any design shortcomings. Much like its counterpart, the CREATIVE comes with a 1,100-watt heater, quickly and efficiently heating water to desired temperatures with the press of a few buttons. The flow rate is a bit lower than the CHEF, offering 6 liters per minute compared to 12. This means that the maximum effective container size is 20 liters, to avoid inadequate circulation. However, 20 liters is more than sufficient for almost all home uses. The Gourmia GSV900 is the final home sous vide machine on our buying guide. This is one of the most affordable full water ovens on the market, and has a 10-liter capacity, putting it at the midpoint between the two Sous Vide Supreme options on the list above. The base of the Gourmia product is stainless steel, leading to a higher weight than alternatives. However, the design and handles of the water oven allow for quick and easy movement and lifting when needed. The top of the unit has a transparent lid for keeping an eye on things. However, higher temperature cooking can cause it to steam up, obscuring food from view. One drawback to this affordable water oven is its lack of a removable tank. This makes cleanup a bit trickier than the other water baths on this list. The tank features well-marked minimum and maximum water lines, ensuring that first-time users don’t make the beginner’s mistake of filling the tank too high, resulting in uneven cooking. One of the most difficult decisions we have made here at Sous Vide Wizard was selecting the ChefSteps Joule over the Anova Precision Cooker for the top-rated sous vide cooker in our 2019 buying guide. These two sous vide cookers are very similar in many ways, even though they look completely different. Also difficult is their price points, as both these machines are typically priced identical to one another across online shopping options. of sous vide cooking. They are far above the other eight in our buying guide for overall quality to price, as they are less expensive and more accurate than their competitors. Additionally, they can both be used with existing pots, containers, and coolers, and are small and easy to shove away in a cabinet when not in use, giving them a huge edge over full water ovens. For these two devices, we tested multiple criteria, as they were the only two in the list having some of the features and functions compared to older sous vide immersion circulators and water baths: Function and Appearance, Cooking Performance, Application, and Additional Features. One of the most striking differences between these two models of sous vide machine is the overall appearance. The Anova has more of a standard look to it, in stainless steel and black. The Joule, by contrast, is Apple-esque as a minimalist white cylinder. However, this also means that the Joule lacks in onboard functionality, being completely reliant on the relevant smartphone app. This is in comparison to the Anova, which has a scroll wheel and LCD screen to set temperatures straight from the unit itself. Size matters, too. The Anova Culinary Precision is also almost 15 inches long, while the Joule is more diminutive at 11 inches. Weight-wise, the Anova comes in at 2.5 pounds, while the Joule is an incredibly light 1.3 pounds. Both the Anova and Joule have clips to fasten the machine to the side of a container or pot. However, the Joule goes a step further, with a bottom-facing magnet, allowing it to stand upright versus being clipped when placed in a magnetic vessel. 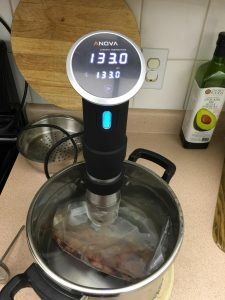 Many things have been cooked with both the Anova and ChefSteps sous vide cookers. They are both spot on, delivering accurate temperatures with both water and the food, without the need to deal with calibration after multiple uses. The water temperature was maintained as well, with the largest variance being less than half a degree Fahrenheit between displayed and actual temperatures. These were the two most accurate sous vide models that were tested in our trials, and reviews across the Internet will corroborate. Both sous vide machines have incredible technology in them, enabling the use of Wifi smartphone apps to control the cooking process in their entirety. The Joule has nonexistent buttons on the body, so its controls are managed through their application. The Anova can control some things via the machine itself, but most steps are handled through the Anova app. Anova’s app includes a partnership with Serious Eats, with detailed breakdowns on water temperatures used for a variety of foods. In comparison, the ChefSteps application for the Joule has videos to show how each step of the sous vide cooking process should flow. The Anova will be able to eventually connect to the soon-to-be-released Precision Oven. This will give the machine the enhanced capacity to bake, steam cook, and sear food with a sous vide torch, expanding far beyond typical sous vide. The Joule has a one-up on the Anova, though, with its flawless integration with the Amazon Alexa protocol. By quickly connecting the Joule to Amazon through the Joule Skill in the Alexa app, users can set temperatures, check water progress, or turn the device off without needing anything but their voice. Due to its integration with Alexa, more compact frame, and more intuitive, helpful smartphone app, the ChefSteps Joule had a slight edge over the Anova Precision Culinary once our research and testing was complete. The only true turn-off that we experienced with the Joule was its complete lack of on-board controls, leading users to be completely reliant on the app for their cooking needs. However, in today’s smartphone-centric society, this should be a non-issue for most with a capable phone and a reliable wifi connection. If you choose one of the water ovens, inclusive of a water bath, it is important to note the capacity of the bath. While immersion circulators generally allow for a wide range of water bath size options (provided you supply the cooking vessel), water ovens are static in their maximum size for obvious reasons. While water capacity is more important for water ovens, heat and circulation ability is more important for the immersion circulators on our buying guide. If using an immersion circulator, food capacity will ultimately depend on the container sized being used. Some of the circulators reviewed, such as the VacMaster SV1, can handle 30 liters of water in one fell swoop. However, if you use a water bath too large for the circulators to handle, you might be faced with improper heating, and a botched product. Many of the sous vide cooker reviews above can heat water to 200 degrees Fahrenheit or slightly higher. While this is impressive, it’s vital to note that these temperatures cap at 212 degrees for obvious reasons (it’s at this temperature the water boils). Low water warnings, letting the user know when too much water has evaporated and more needs to be added into the water bath. Power outage warnings, letting the sous vide cook know when the power has blinked or there has been a service interruption, which could affect the outcome of the food. Timers, which allow the sous vide cook to accurately determine the amount of time until the food has reached the proper temperature, or conversely how long the food has been cooking. All three of these options are available in all ten of the sous vide cookers reviewed in the buying guide list above. 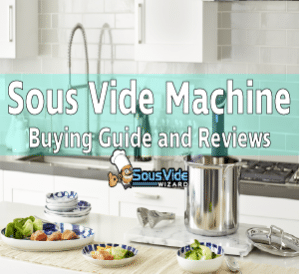 To get the full scoop on each of the ten sous vide machines we have chosen for our buying guide, click the links to read the expanded reviews of the products. The world of sous vide can get complicated. However, with growing interest and massively expanding product options coming to market with increased popularity, sous vide is here to stay. Other important things to note when performing due diligence and digging deeper into immersion circulator reviews and sous vide machine reviews are potential advantages and disadvantages of things such as leaking, connectivity issues, hard scale buildup, and safety concerns. Finding the best sous vide for your needs doesn’t need to be a complicated process. The options are limitless, but with buying guides such as this, we strive to provide brief, honest product reviews and results, to make the process a little bit easier. 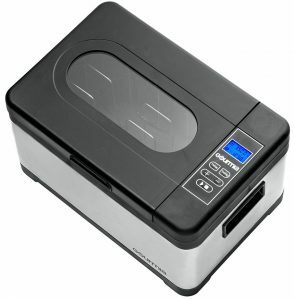 What vacuum sealer should I get with my Anova? Great site by the way! 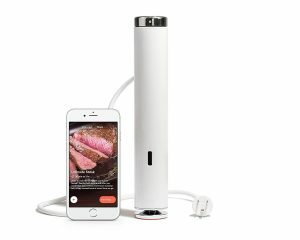 I’m looking for a simple sous vide immersion circulator for my aging mother. What do you recommend? I love love LOVE the Tribest machine that I bought. Thanks for the recommendation! Thanks Erin! Glad to here it! Where do you recommend that I buy the Chefsteps Joule from? Also, do you have a recommendation for a vacuum sealer for it? I live in Turkey, and the Joule says don’t use the machine on an outlet with a converter. Is this the case with your other top picks? I really want to start sous vide cooking! Some genuinely quality blog posts on this website, saved to bookmarks. 1) Anova – It’s most redeeming functional use is that you can use it to cook large quantities because it can be used with any size container. Think brisket or a large rib roast. I am not certain that it maintains the temperature or if it varies between +/- a few degrees. But you can’t beat the flexibility that it provides. 2) Mellow – This thing is really great. It keeps food cool until it is time to start cooking to a user defined stop-time. Think poached eggs. You put the eggs in at night and the next morning they are cooked perfectly. It is controlled by an app that really helps with how long something needs to cook. I know, it doesn’t matter because it can’t overcook. That is true, but I do find that on nicer cuts of beef, that it does seem to dry them out if it is in the bath for to long. On tough/cheaper cuts of beef, it is a completely different story (the longer the better). The sous vide bath is small. Really to small for a roast and any large portions. But, if that isn’t a big deal, it is great. 3 ) Sous Vide Supreme SVS10LS – It is really hard to beat this piece of equipment. While it does have a set capacity that restricts you from cooking something really large, it can cook a rib roast with no problem. But where it shines, is the constant temperature control. It just turns out some of the best meat you will ever have. I have no real reasoning for this at all, but man I can tell a difference. Another added benefit is that is totally quiet, and so easy to use and clean. The price was a bit hard to swallow and I felt bad when I made the purchase. But now it is an everyday tool and has made my average cooking much better. Out of all of them I use the Sous Vide Supreme the most because I feel that it does turn-out the best results. That said, I use all of them for different reasons. Mellow: breakfast, SVS10LS: best results, Anova: when I need to go big. Okay. 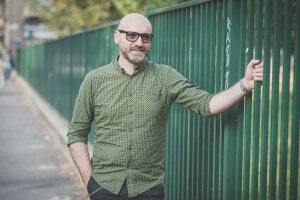 I hope hope this is of interest to somebody. Thanks!